Blotch and Thrum: Fiber Expo! Today we went to Fiber Expo with some friends. That was us, the group with the four little kids! ;) We like to look at all the animals. Anyway, it was awesome, though I never get to browse as long I'd like, I even managed to purchase some things, though not everything on my list. 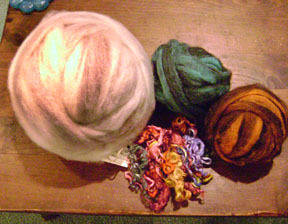 I also got some jewel toned locks of long wool, and some black striped roving (2 oz each, orange and teal). Bricolage Studios Her yarn and jewelry are amazing. Also, she shared a booth with the excellent Hands and Notions, from whom I bought some fiber at Maker Faire this summer. Happy Fuzzy Yarn. Very cool stuff, lots of hand dyeing. The Counting Sheep Farm Carded batts and hand-dyed fiber.